Product categories of Line Laser, we are specialized manufacturers from China, Line Laser, Line Lasers suppliers/factory, wholesale high-quality products of Line Level Laser R & D and manufacturing, we have the perfect after-sales service and technical support. Look forward to your cooperation! 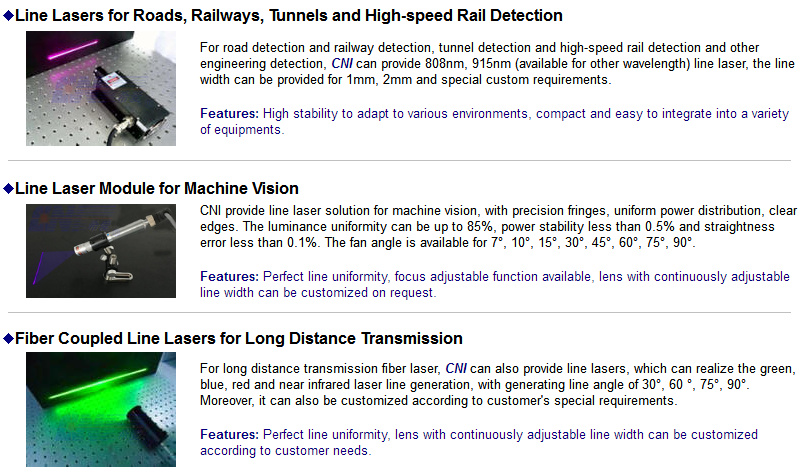 CNI can offer line lasers at all existing wavelengths and output power, also the divergence are available in fan angles of 5°, 7°, 10°, 30°, 45°, 60°, 75°,90°and 100° for custom applications. These series lasers can be used to display a uniform straight reference line for use in alignment, machine vision systems, construction and process control.